A baby’s skin is sensitive and delicate. That is why it is important to pay attention to the products that you use on it. There are many baby products that are marketed as safe and gentle but not all of them are. The best baby products have few ingredients and do not contain parabens, fragrances, and other artificial, harmful chemicals. Are you using safe products for your baby? Newborns do not need baby lotions because the skin beneath the outermost layer is moist. You might feel the need to moisturize babies because their skin appears to be very dry and flaky, but actually, they do not need to be moisturized. As advised by pediatricians, use baby products that are proven safe and gentle. Some moisturizers that you can apply to baby’s skin are olive oil and petroleum jelly. They are gentle and very basic formulas, although they may be greasy. Use very mild moisturizers that do not have artificial colors and fragrances. Too strong baby moisturizers can trigger baby’s immune system to fight off unknown substances. This can cause eczema, rashes, allergies, and other skin reactions. It might affect baby’s development and growth. If you are advised to apply moisturizers on your baby, one good choice is Johnson’s Baby Shea and Cocoa Butter Lotion. 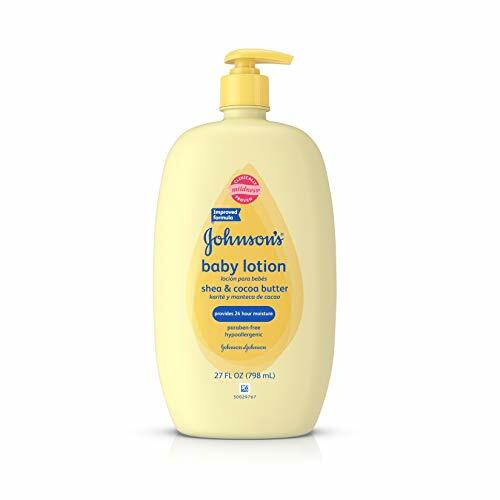 Johnson’s Baby Shea and Cocoa Butter Lotion is a formulation of a few ingredients including water, mineral oil, glycerin, stearyl alcohol, sodium citrate, and others. The main ingredients are butyrospermumparkii (shea) butter and Theobroma cacao (cocoa) butter which are effective and safe moisturizers. Johnson’s Baby Shea and Cocoa Butter Lotion is clinically proven gentle and mild on baby’s sensitive skin. Its formulation is intended for babies. Johnson’s Baby Shea and Cocoa Butter Lotion can relieve skin dryness in just 24 hours. The skin absorbs it quick and conditions baby’s skin. It is not greasy and leaves baby’s skin soft and smooth. When it comes to your baby, you only want safe and mild products. That is why many parents have shared their positive feedback on Johnson’s Baby Shea and Cocoa Butter Lotion. This baby product has very few cons. Johnson’s Baby Shea and Cocoa Butter Lotion is a pretty good choice as a baby moisturizer. It contains mild, gentle ingredients, specifically shea and cocoa butter which are long known to moisturize skin. It has very mild long lasting fragrance that is not irritating. It is non-greasy, fast absorbing, and does not sit on skin. Johnson’s Baby Shea and Cocoa Butter Lotion is not only intended for babies, but also for the whole family. It is mild on adult skin too and can be used on the face. Users share their experiences on using Johnson’s Baby Shea and Cocoa Butter Lotion, saying it has a warm smell, relieves dry skin fast, very mild, and more. The price is just right for the size of the bottle. However, some users say that Johnson’s Baby Shea and Cocoa Butter Lotion caused skin rashes and dry skin. Some say is lacks a factory seal. But overall, Johnson’s Baby Shea and Cocoa Butter Lotion is a safe, gentle, and affordable moisturizer for sensitive skin. There are more baby moisturizers in stores today. One of them is Epi Max Baby and Junior Cream. It is a bit more expensive than Johnson’s Baby Shea and Cocoa Butter Lotion. Epi Max Baby and Junior Cream is especially formulated for all skin types of newborns, babies, and children. It is an all-around moisturizer that is proven to be hypo allergenic, dye free, and fragrance free. It is water soluble and can be used as an alternative to soap that may cause dry skin. Dermatologists recommend it too. It relieves dry skin leaving it healthy and moisturized. When it comes to comparing Johnson’s Baby Shea and Cocoa Butter Lotion and Epi Max Baby and Junior Cream, Johnson’s Baby Shea and Cocoa Butter Lotion stands out because it is more affordable and contains natural moisturizers, shea butter and cocoa butter. The skin absorbs it fast, leaving no irritating greasy feeling. Plus, it has a mild long lasting fragrance. Johnson’s Baby Shea and Cocoa Butter Lotion leaves not only baby’s skin soft and smooth, but also makes adult skin well moisturized and conditioned. It is rated 4.5 stars in online stores and many users are satisfied with its formulation. Dermatologists recommend it too. No wonder Johnson’s is the leading brand in skin care products because it formulates only safe, mild products for babies and adults.